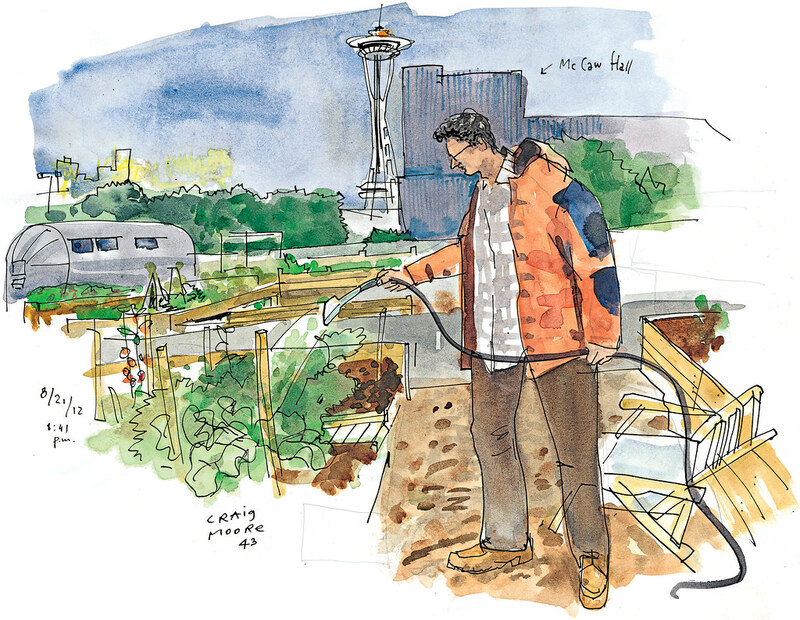 The Mercer Garage rooftop P-Patch, which opened in early June, is starting to yield some crops. I tasted a tomatillo from Stephanie Krimmel and Craig Moore’s plot and it was pretty sweet. Who knew you could garden in a few feet of soil laid over concrete? 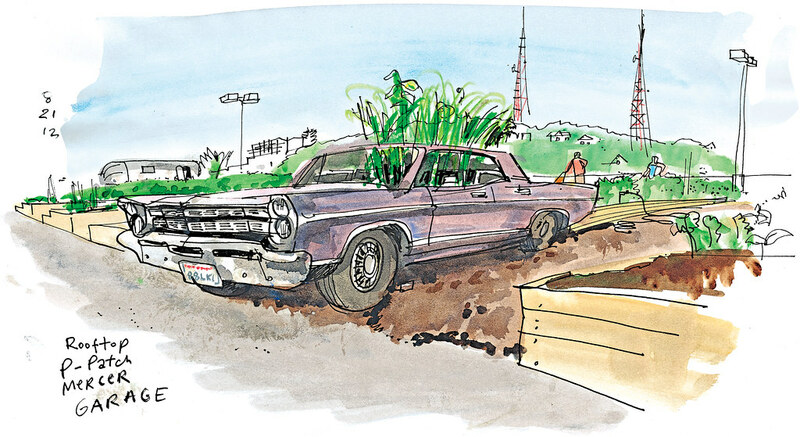 To help build the P-Patch, the Krimmel-Moore family put in 150 hours of labor — the most of all volunteers vying for a plot. That gave them first choice of the 98, 100-square-foot plots available. They picked one with great views of the garden’s terraces, not to mention the city skyline and the soaring Space Needle. 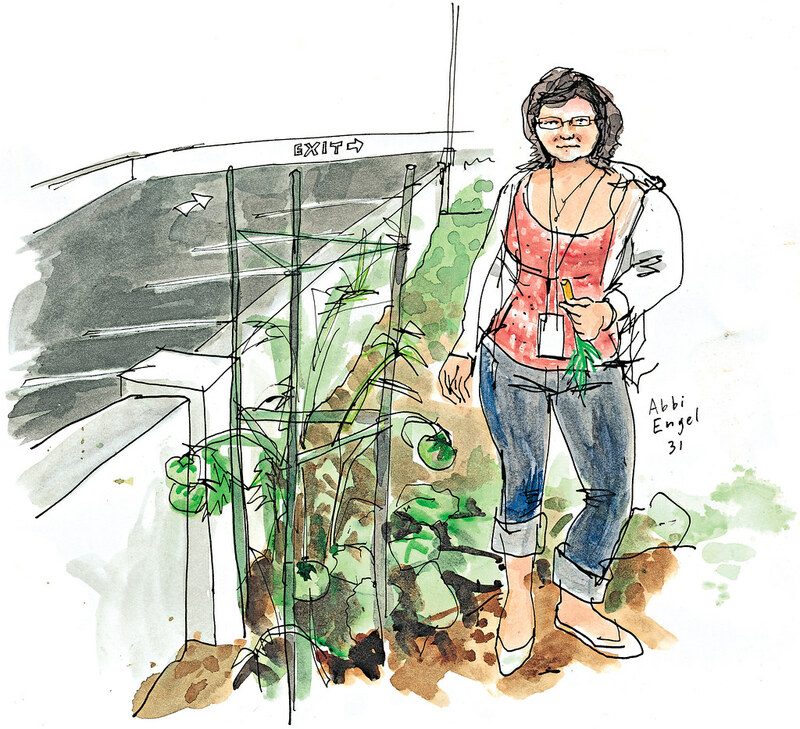 UpGarden, as the P-Patch is known, occupies about a third of the Mercer Garage rooftop parking space. 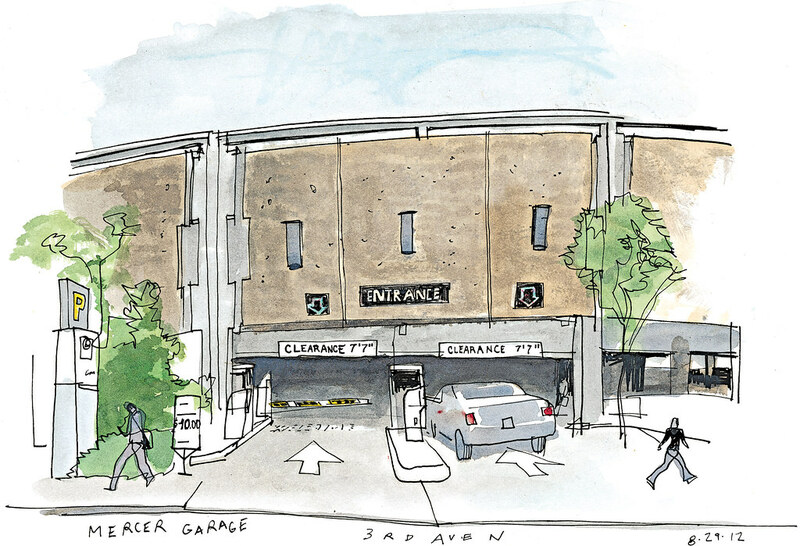 The sloping ramp where cars used to park is practically unrecognizable. Instead, you see a swath of green surrounding an old Airstream trailer where the urban gardeners keep their tools. 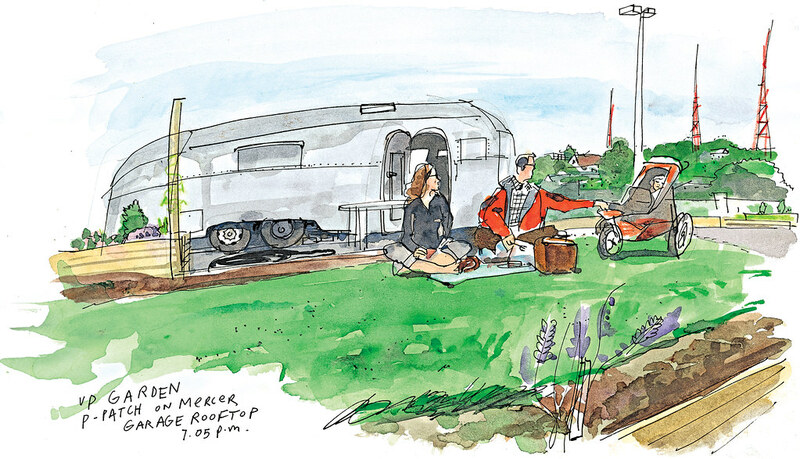 A lawn in front of the trailer is the main gathering space, and that’s where I sketched Stephanie Krimmel and Craig Moore as they enjoyed a picnic while their daugther, Bailley, napped. Scott Mills, a 58-year-old retired truck driver, put in nearly as many hours as the Krimmel-Moore family to qualify for his plot, where he has been growing squash, broccoli and herbs such as basil. He also has built a cool birdhouse that makes his patch stand out. Mills said he doesn’t really eat much of the food he grows; he takes it to food banks instead. Abbi Engel was eating a carrot when Mills led me to her plot. The 31-year-old biologist said her love for gardening comes from her farming family in Nevada and Idaho. The smell of the tomato plants at Engel’s plot reminded me of my dad’s garden in Extremadura, Spain. 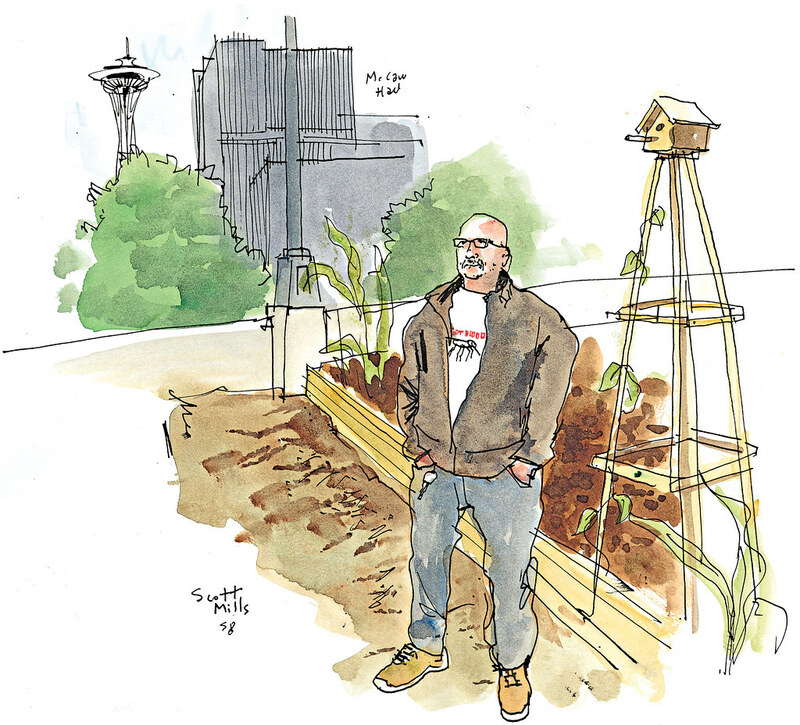 Next time you are in lower Queen Anne or park at the Mercer Garage, you may take some time to visit UpGarden. I’d like to know what you think.